‘Tis the season. Not that one, but the season where anyone and everyone stands a chance at making a buck if they’re selling a weight loss or fitness product. Some of the most amusing products surface in these first few weeks of the new year. This year, it’s a surprising new fitness book written by 50 Cent. Wait? Isn’t he a rapper? What’s he doing selling a fitness book? That’s what we thought, too. 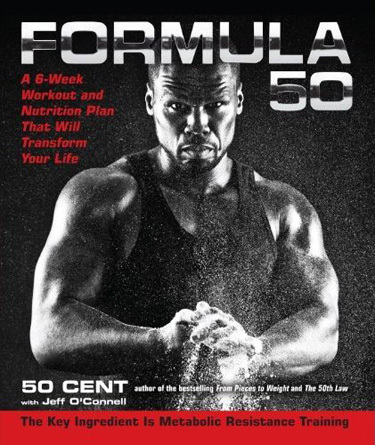 50 Cent, or Curtis Jackson III, just released his new book titled Formula 50: A 6-Week Total Body Transformation Plan. It is targeted to weight training enthusiasts and features the metabolic resistance training method and a nutrition guide. Furthermore, the book is supposed to give readers an “all-access pass to [50’s] premium plan for lifelong fitness.” If you’re picking up on a tone of skepticism, you’re reading this right. There’s no denying that 50 Cent is in incredible shape. Clearly he follows a plan that puts him in better shape than most athletes, let alone rappers. However, the book (and common knowledge) indicate that he has no formal training or credentials to back his fitness advice. Is being fit and a celebrity enough to safely offer fitness, weight training and nutrition plans? As the founder of one of the leading fitness certifications in the country, Ellis has spent his life in the industry and was able to provide some valuable insights about 50’s new book. Ellis mentioned that many of his colleagues have either ghost-written or co-authored with celebrities who have published nutrition or diet books and he assumes 50 has done the same with Formula 50. A safe assumption as Jeff O’Connell has an author credit on the cover. Ellis notes there are just too many issues of safety, science, or even protocol for an untrained professional to reference on their own. Maybe this is true. Maybe readers will just share a six-week journey with the rap star, see how he works out, and maybe be better for it in the long run. We’ll err on the side that a more credentialed professional carried most of the weight behind the scenes, because we all know if the shoe were on the other foot a scientist would get booed off stage in a heartbeat.